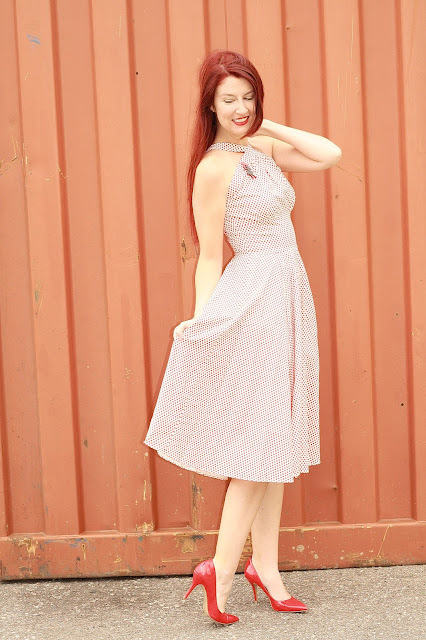 Bernie Dexter Colette Dress (Red and White Polka Dot) Review! This is another Bernie Dexter Zulily purchase that I made this spring and since it's a newer style and certainly a new to me style of hers, I thought I'd review it! This style is the Colette dress and print is officially called Red and White Polka Dot. I'm rarely a sucker for polka dots anymore, but not because I don't like them! I have tons of polka dotted items and where them plenty, but I just don't really purchase any new ones anymore. I think once you have a few dotted hues in your closet your brain goes "enough." (At least that's what happened to me!) This dress was different though because I loved how classic it was and the neckline really intrigued me. There's a similar dress she released, the "The Susie" (below), and I loved it. But the rib cage line made me a little nervous. I wasn't sure it'd be flattering on me, especially since my rib cage slightly protrudes out around there. AND she's put out another print or two in the Colette style, so I wanted to try out this style at a cheaper price. The similar dress I passed, the Susie. Same print but different cut and style. Very lovely though! The verdict? I really like it! I find the fit to be what I consider normal for Bernie Dexter (no surprises here!). It's a higher neckline, and a somewhat unusual one, so every time I put it on for a split second I think it's too tight...but then I adjust and all is good in the world. This is also a dress that is a full circle skirt, which is worth noting as not all Bernies are full circle skirts! (I'm size XS for measure). I kept the styling of this dress very simple. Between the classic polka dots, red color, and interesting neckline, I consider it something of a statement piece so I didn't want to overdo it. Dress- Bernie Dexter via Zulily (There's no specific link to this dress from her site currently, sorry. But her whole site is HERE). Did people stop you on the street while you were wearing this dress to tell you how FREAKING AMAZING you look?!? This dress is perfect on you! I like it so much better than the Susie, because it's truly unique! Just took a break from writing this to check if the Polynesian print Colette is still up on Zulily… Fortunately for my wallet, it's not. Oh, I love these little polka dots! Adorable! The neckline is really interesting and what catches my eye right off the bat. I could totally see you do a fantastic twirl with this skirt too! You're so beautiful! I love this dress on you, the red and your red hair are such a matchmake pairing. You should try the Ixia Pull Up a Cherry Dress, it'd look fantastic on you! Love your dress! You looks so pretty! This dress is beautiful on you! I mean obviously you're gorgeous and you'd look amazing in anything, but this dress is extra lovely on you! I like this polka dot print! It's smaller than some and feels different. This dress fits you so well! Great look ! It feels like it's taken out of the 50's, love it! That dress is absolutely amazing! This fits you perfectly! It's so darling. You look stunning! You should like it, it is beautiful and you look gorgeous!!! You look gorgeous in this red polka dot Bernie Dexter dress and your poses are so cute. Definitely a red hot look! Your shoes always go so perfectly with all of your outfits. This dress looks amazing on you. Such a pretty color and print. I hear you about polka dots. I love them to bits and do add the occasional new spotted piece to my closet, but given that I can think of at least ten polka dots and accessories off the top of my head without even cracking the closet door open, I think it's safe to say I'm fairly set there at the moment. Very pretty dress! Thank you for the great review of it. I really, really like BD's offerings, but only own one (bought, gosh, over four years now, I believe) because they're extra pricey for those, like me, outside of the States who have weak dollars, high shipping costs, and import/customs fees to deal with. Still, I'm perpetually tempted and hope to invest in more as time goes on. Love the shape of this dress on you! It looks great and is so cute! I know what you mean about polka dots. I have tons of polka dots and while I love navy with white dots I hope I will never buy another navy with dot dots dress in my life as I have enough! Glad you got this one though! Such a fun cut on you! Oooo this design is so freakin' cool, that neckline just makes the dress! I saw this outfit on the ModCloth Style Gallery last week and I seriously gasped! This dress looks like it was specifically made for you! You are so rocking it! I really love its neckline too. I'm loving your dress so much!